Finished Size: 34½ (39, 43, 47, 51)“ bust circumference. Cardigan shown measures 39”, modeled with some positive ease. 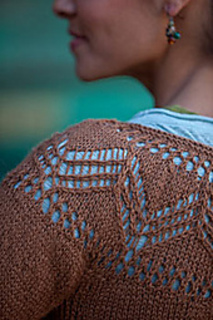 Yarn: Misti Alpaca Lace (100% alpaca; 437 yd 400 m/50 g): #NT304 natural dark tan, 5 (6, 6, 7, 7) balls. Needles: Body and sleeves—size 9 (5.5 mm) 24” circular (cir). Pick-up and trim—size 8 (5 mm): 24” cir. Adjust needle size if necessary to obtain the correct gauge. Notions: Removable markers or waste yarn; five ⅝“ buttons; tapestry needle. Gauge: 19 sts and 25 rows = 4” in St st on larger needle with yarn doubled. The right and left sleeves are mirror images of one another, and the front armhole edge of each sleeve is shorter than the back armhole edge.